With us, the process of creating your distributor website is a breeze. You can fill up a form and choose a pricing plan – more on that later – and you can launch your website in just a few minutes. Just as creating a website on our platform is easy, we have also made customizing the site and sharing your thoughts and stories as simple as possible. All you have to do is click (or tap) a few times and you will have a unique website ready to go. You can even add social media buttons on your website in one single step with the help of our platform, allowing you to share your stories across all major social platforms seamlessly. If you have trouble setting up your site, visit our tutorial page to watch videos on how to perform each task quickly and efficiently. 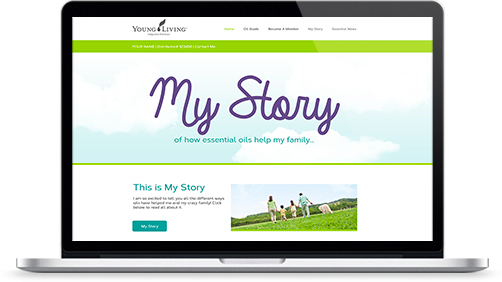 You can bring your essential oils distribution business to the World Wide Web by creating a website using our site. And for the users’ convenience, the site is designed to be mobile and tablet friendly. For the benefit of our subscribers, we offer 3 different pricing plans. First, there is the ‘Starter’ package which will deliver great value to entrepreneurs who are new to the business; it is free and includes many great features. The Basic and Pro packages cost $5 and $20 per month respectively. Each package has its own set of unique features (the Pro package includes all features of the Basic package). You can view details of features for each pricing plan by clicking here. So, what are you waiting for, set up your site right now and start enjoying all the advantages mentioned above. If you need any further information regarding our services, feel free to get in touch with us.